Smallville. Back in the Day. Lana is leaving Smallville. Clark is upset because he thought they would end up together but Lana points out that while she cares for him she has things to do in this world just like he does. Metropolis. Four years later. Superman goes up against a group called the Supremacists. Despite knocking him back with a sonic cannon Superman manages to not only stop them but burn down their warehouse as well. He revels in his powers and actually laughs at one of the terrorists while the man cries. Later he feels ashamed and wonders if his powers make him is a bully. With his super hearing Clark learns of a powerful storm bearing down on a Gotham City without power thanks to a madman named the Riddler. Two leagues off of Gotham the Coast Guard prepares to evacuate the crew of a boat caught in the storm. The electrical engineer, Lana Lang, refuses to leave with the crew and elects to stay with the captain against his orders. Meanwhile Superman tries to create a vortex of water to stop the hurricane but fails. He spots an oil tanker heading towards another the boat. On that boat the Captain spots the tanker as well and is told that it has been completely evacuated so they need to get the power back on. In the engine room Lana feels fear for the first time that day but rallies the remaining crew to get the boat moving. Outside Superman pushes against the tanker as Lana and crew fight to get their ship going when suddenly the tanker explodes blowing the Man of Steel back to shore. Lana's ship is back on course and the captain congratulates her on never giving up. As Superman listens to the conversation a man calls to him from across the beach. The man and a group of people have found shelter and Superman thinks they are going to need more cover. He tries to move a nearby boat but with everything that just happened Clark is a bit wiped out. The man points out that Superman is pretty strong but Superman feels that he is not strong enough. With a smile the man starts to help Superman move the boat to give them cover./On his lunch break Clark muses on all of the crisises that are constantly breaking out around him. Suddenly he feels something weird coming from below the streets. Something far away and dangerous. Meanwhile in Venezuela Lana Lang and her crew unearth something large and dangerous. As Lana wonders what it is the creature lets out an unearthly scream. Thousands of feet below Venezuela Lana Lang and another man are being chased by a giant monster. She grabs a machine gun to distract the creature in an effort to let the others escape but help soon arrives in the form of Superman. After a minor setback Superman throws Lana's truck at the creature who easily catches it in his mouth. Superman watches the creature for a moment and after missiles from nowhere slam into the monster Superman notices it that its cries aren't roars but appear to be some form of language which implies that he has not been fighting some mindless beast. He takes out the drones that fired the missile but this brings in the Ghost Soldier, who attacks Superman and manages to drive a knife into the Man of Steel's chest. As the creature burns down the nearby fields because of the pain the missiles cause Superman realizes that his heat vision and freeze breath can slow the Ghost Soldier down and after getting everyone clear he seemingly flies the creature into space and throws it into the sun. Six hours later Lana leads an expedition team to the site they are planning to drill and spots something that Superman might be interested in. At the Fortress of Solitude Superman checks in on his newest guest, the creature from Venezuela. He feeds the creature, watches it as it settles down to sleep and is shocked to see it change into a small, humanoid child. Clark remembers the day he discovered his super-hearing. It was soon after he fell out of a tree and wasn't hurt by the experience and somehow he got it in his head that he could fly. In addition to the sounds of nature he heard his parents talking about the fact that he wasn't human and soon after that they revealed how they found him and gave him the blanket he had been wrapped in. In the present that same blanket, now his cape, is being used by the creature that was a rampaging dragon monster and then a little boy and now a mixture of the two. Clark isn't sure what to do with him but he tries to be reassuring. The youngster, Clark believes his name is Baka from the word he keeps saying over and over again, gets loose and runs through the Fortress settling finally in Clark's bedroom. Just as Baka sees a picture of Lana she calls and tells Clark about what she found in the caves where Baka had come from. She sends Clark some pictures she took of the cave painting which freak Baka out a bit before heading back down there before some suits shut her down. Lana is intent on finding something and doesn't know that the Ghost Solider is following her. She discovers a giant pink orb floating in the middle of a hidden room but before she can really study it a gaggle of monsters attack. Clark, having changed to Superman, arrives just in time and defends her. Baka comes along too and after Lana mistakes him for another creature Superman explains that he is a friend. Soon a humanoid man steps forward and tells them that these creatures are not all bad. Superman is prepared to fight, especially when the man seems to threaten Baka but soon the man informs Superman and Lana that they are not there to hurt them but rather protect them from the hidden curses, glories and temptations of Imperial Subterranea. Superman and Lana are shocked to see an entire city come into view. Elsewhere in Subterranea a woman claiming to be queen is told of the breech in the seal keeping them hidden. She prepares to head into the world and let the people of the sun pay homage to their grateful queen. Ukur scolds Superman for breaking the seals to Imperial Subterranea and awakening the most terrifying threat the world has ever seen. Superman and Lana are dubious of this claim as the threats in question turn out to be short, cute, little creatures that appear harmless. Lana and Superman investigate the power source of the underground realm before Kokya, Queen of Subterranea rides forth and thanks them for releasing her. Kokya only wishes to speak to Lana and soon Lana, along with Superman and Ukur are led to the castle and given shelter. From a safe vantage point Ghost Solider watches this and reports back to his superiors. Lana and Clark wash up and talk about the fact that Clark lied to her about killing Baka. The sudden scream of one of the creatures that scared them from earlier sends the two running and they come upon a room where one of the creatures from earlier is being drained of his life energy. Superman flies in to rescue him but Ghost Solider tries to stop him stating that Superman doesn't have the right to start an incident. This doesn't do much good and soon Superman is corporeal again and blasting the creature free. Ghost Soldier joins him and soon the Solider, Superman, the creatures and Lana Lang head to the surface. Their victory is short lived as Ghost Solider stabs Superman through the heart saying he may be a ghost but he's still human and that he'll never side with monsters against his species. As Superman recovers from his knife wound the "little guys" (as the Man of Steel calls them) start to grow and change into more savage creatures. Baka tries to help; first Superman and then the little guys but the Ghost Soldier attacks again and kills several of the formally small creatures. When the Soldier tells Lana that the only one to blame is Superman the Man of Steel launches at him, first with heat vision and then with cold breath, which solidifies the normally intangible warrior. 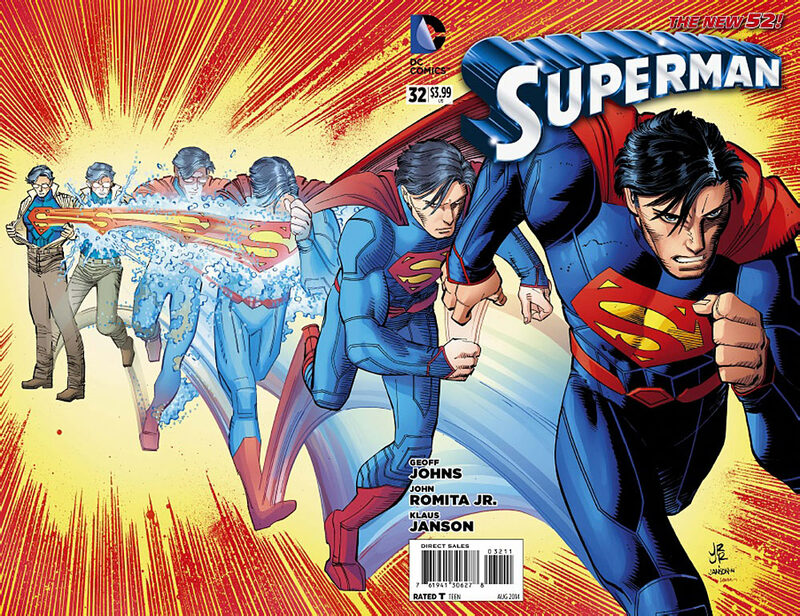 Superman grabs the Soldier's visor and sees the men and women behind the intangible warrior. The Man of Steel tells Lana he is going to shut them down. Suddenly Ukur bursts from the grounds and after surveying the scene announces that he is going to take Baka back. Before Superman can do anything he spies a squadron of unmarked military planes carrying some heavy ordinance coming towards them. After a brief argument with Lana Superman says his goodbyes to Baka, who Ukur reveals to be a prince. Once they are gone and Lana is secured Superman takes down the approaching planes. When the battle is over Lana and Superman sit together as the creature they had saved succumbs to his injuries. Lana asks Superman if he's okay and adds that with everything that is happening it is okay to cry. Superman has a better idea and after grabbing the Ghost Solider he flies towards Tower Control. 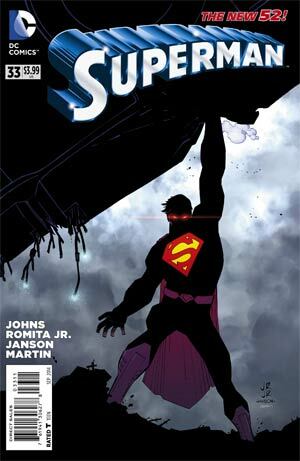 Several of the techs at Control start freaking out but a woman named Harrow steps forward and assures them that while Superman is powerful nothing can prepare him for what they have in store. In the arctic, Tower Control succeeds in releasing Doomsday from the Phantom Zone. After killing a polar bear the creature's attention turns to two civilians. He doesn't kill them directly but after destroying the ice burg he landed on the people die anyway. Control isn't even sure how Doomsday's brain works but they know he is planning something. This may not be the same old Doomsday after all. Meanwhile Superman attacks Tower Control. His opening move is to freeze a group of ghost soldiers that, like Sawyer, don't have a heartbeat. He throws Sawyer into the facility and starts trashing the place when he is confronted by Harrow, commander of The Tower. Superman rattles off the crimes Tower has committed recently but Harrow never wavers in her contention that Superman himself is the greater threat. Realizing Superman is not going to back down Harrow resurrects hundreds of soldiers from over a thousand years of war and fighting. Superman knows that they don't want any part of this but Harrow counters that of course they don't but if Superman won't leave the world alone the dead will protect their own. At first Superman fights the ghosts but then lets them attack so he can prove that Harrow is the real enemy. They turn on her but instead of destroying them Harrow sets them free. Superman has the chance to end Harrow once and for all but pulls his punch and suggests that they should work together. Harrow says that this proves that what she said before was right; Superman doesn't know how to make the hard decisions. The next time they come for him they will kill him. Then he can join her... if he is still willing. Meanwhile, in the Mariana Trench, Tower Three contacts Tower Control and informs them they have a unit standing by for orders. Tower Control copies that and announces that the Bluebird has become too strong. They need something stronger. It is time to wake Doomsday... or whatever Doomsday has become. Superman Doomed: Infected - Chapter One: "True Believers"
Superman wakes up from a nightmare while Lana Lang tries to figure out how to get to him despite the military presence surrounding her. Wonder Woman arrives followed by Lex Luthor, Cyborg and Martian Manhunter and the rest of the Justice League. As they fly away Wonder Woman tells Superman that Lex has been given special clearance to coordinate events, which upsets Superman but not as much as Lex telling Superman that he is going to be quarantined. After another brief nightmare Superman flies off after some encouraging words from Wonder Woman. Batman joins the investigation as Superman flies to Alaska and finds Krypto. Krypto doesn't wig out on Superman leading him to believe that he isn't dangerous. Superman sleeps through the night and starts to feel better but some hunters shooting at wolves from a plane draw his ire. He confronts them and tries to calm down but eventually flies through the plane and causes it to crash. This time it's not a dream and despite the fact that it shouldn't Superman's actions make him feel good. Elsewhere Senator Lane meets with John Henry Irons, who survived longer than just about anyone outside of Superman when he took on Doomsday. Irons armors up in organic steel, which is keeping his cellular degeneration at bay for the moment and asks Lane what he wants. His answer is simple; Superman. Lane is concerned that the battle with Doomsday affected him and wants him in a secure location so that they can help him. Steel is a little dubious because the secure location Lane is talking about happens to be a prison. In Smallville Lois tries to convince Lana to leave but she chooses to not only stay behind but take off her protective suit despite rumors saying that the fallout from Doomsday's attack is killing people. Lana believes in Superman. That's good enough for her. Meanwhile Superman tries to gain access to the Fortress of Solitude but fails the DNA check. He also notices that bony protrusions have grown out of his hand. Krypto turns on him as well leading Superman to think that he should be going to his friends for help but he doesn't need them to believe in him. He knows who he is. He's Superman and he is going to save them all. Superman Doomed: Enemy of the State - Chapter One: "Nightmare"
Superman remembers a reoccurring dream he had when he was nine. That nightmare has sadly come true for him as an adult. As he flies along bombers spot him and attack. Superman can't blame them. If your average person sees something do the things he's done you have to stop it. At a press conference held at Salvation Tech Emergency Evaluation Laboratories in Manassas, Virginia Senator Sam Lane officially declares Superman to be an enemy of the state. Lois Lane is next to speak and she tells the world about the fact that Superman nearly killed her the previous night. Wonder Woman tries to call Clark but gets Lana Lang instead. The women discover that not only did Clark rig his phone number so that the two of them could talk if things got bad but that they also both still trust Superman. Lana tells Wonder Woman about the strange energy readings coming from the people in Smallville that have mysteriously fallen into comas and asks Wonder Woman to tell Clark that she's on it. Wonder Woman flies off in search of Superman. As Lois and her father calm an agitated John Corben the hero known as Steel finds Superman in Chile. Superman tells him that Lois was right about him being dangerous. Steel makes a few suggestions but Superman refuses to run and gives Steel a key to send him to the Phantom Zone if things go bad. The Doomsday virus flares up again and Superman tells his friend to leave. Lex Luthor contacts Steel and tells him that they are about to engage Superman and take him in. Steel flies out to stop them and is confronted by Metal Zero and the Atomic Skull. Lex tries to convince Superman to leave but Superman sees that if Metal Zero attacks him the resulting explosion will kill both of them. 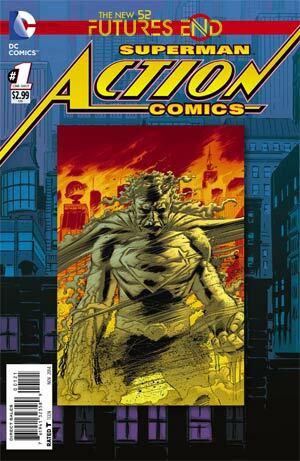 Superman confronts Corben and tries to reason with him but Corben knows that his was a suicide mission. 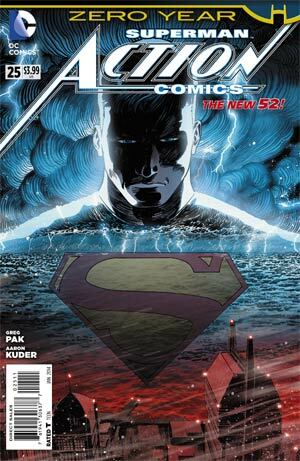 The ship explodes and Superman watches Corben die as the Kryptonite envelops him. Steel flies to the impact site and Senator Lane orders him to hit Superman as hard as he can. Lex warns Steel that the Kryptonite did nothing but weaken the part of Superman that was still Superman. All that is left... is Doom! Superman Doomed: Superdoom - Chapter One: "Unbound"
Lana Lang and Steel load up weapons and equipment into one of Steel's ships. Their mission is simple; track down whatever is drawing signals from the brains of the comatose people of Smallville. They run into a little trouble from government drones but manage to evade them much to Lana's enjoyment. Meanwhile Superman is having a real identity problem. He feels the Doomsday virus' effects getting stronger and his cousin Supergirl, now a Red Lantern, is no help in fighting off the darker urges the virus is bringing to the surface. 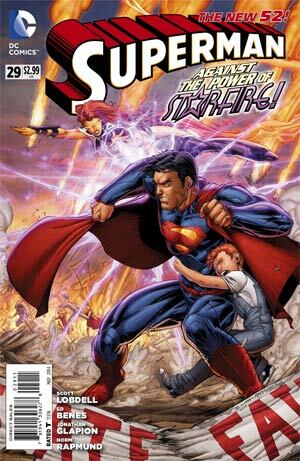 Supergirl brings him to the planet Char where a being known as Harak is busy destroying the place. Superman helps the remaining survivors escape and Harak attacks him. Their fight endangers the fleet of escape vessels which upsets Harak despite him destroying their planet. 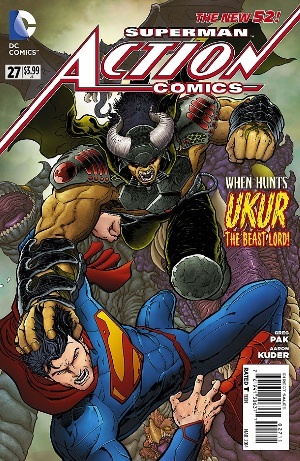 Superman uses his new abilities to save the survivors and then best Harak as Doomsday's influence increases. Elsewhere Lana and Steel discover that the signals that caused the citizens of Smallville to fall into a coma are headed towards Metropolis. Lana tries to contact Lois but discovers that Lois is in on the plot. What's worse is that the ship is about to come under attack from a cyborg that looks like Superman. Superman Doomed: Superdoom - Chapter Four: "My Body is a Cage"
As Lois Lane fights to get free of Brainiac's control Brainiac welcomes his invading fleet. The fleet attacks and decimates its targets. Meanwhile Batman meets with Lex Luthor, Ghost Soldier, Harrow and Dr. Veritas in the Fortress of Solitude. They go over what they already know about Brainiac and his plans. Ghost Soldier is sure of one thing; Superman is going to come back to Earth despite being infected with the Doomsday Virus. Superman does return but his presence causes more problems than it solves. Batman begs him to stay away while Lex just wants to kill the former Man of Steel. Batman's plan is to remove all of the Kryptonite from Earth's atmosphere and the key to this is Dr. Xa-Du, the Phantom King. Xa-Du is less than cooperative and Harrow does her best to contain him. 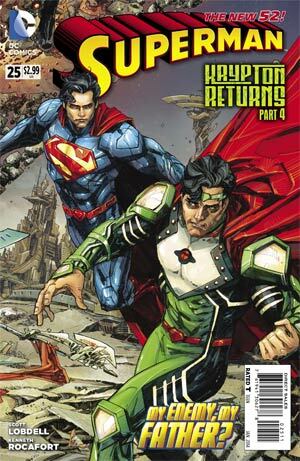 In Sao Paulo Superman arrives in time to help Martian Manhunter but his help is unwelcome. J'onn manages to momentarily suppress the Doomsday Virus but it proves too strong. 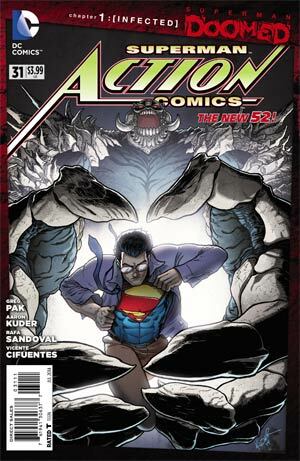 Ghost Soldier arrives with Baka who becomes a monster once again to stay with Superman as the virus begins to take hold. Despite this Superman manages to stay in control and fight Brainaic's forces. 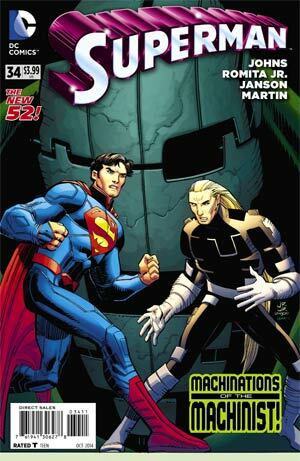 Brainiac and Luthor continue their search for a way to remove the Kryptonite from the atmosphere as Superman and Baka attack Brainiac's main ship in Metropolis. With Superman's help Lois is able to break free of Brainiac's control and in turn helps Superman by telling him that he's not alone. 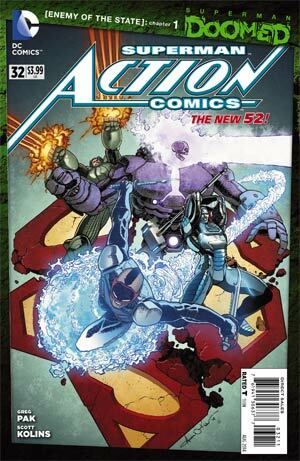 Batman, Lex, Harrow and Veritas succeed in removing all of the Kryptonite from the atmosphere which frees Superman of Doomsday's influence. Superman and crew take down the ship but it turns out that Brainiac has another plan. Lex informs Batman that if he knows anything about villains it's that they always have a back-up plan. That plan turns out to be a massive ship that dwarfs the Earth coming out of a dimensional rift. The battle is far from over. 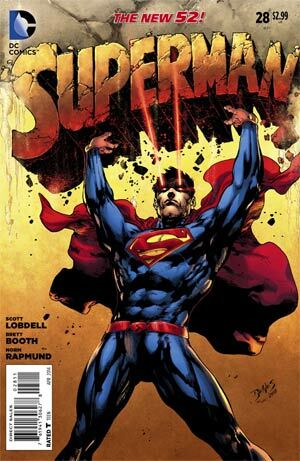 Superman Doomed: Last Sun - Chapter One: "Assimilation"
Red Hood and the Outlaws are busy saving civilians in Gotham when Batman contacts his former prot�g� to tell him that he needs to get the people underground. 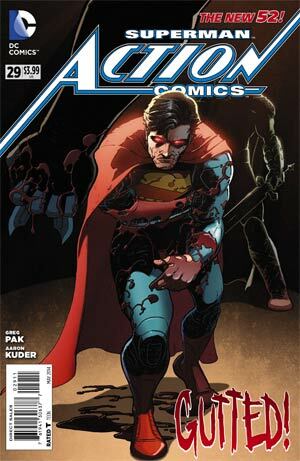 His warnings come too late as Brainiac's ship takes control of Red Hood, Arsenal and everyone else in the area. In the Fortress of Solitude Batman, Lex Luthor, Dr. Veritas, Ghost Soldier and Harrow argue about who they need to go after first; the Phantom King or Brainiac? The situation is made trickier by Brainiac taking over more people all over the world. Soon the most powerful minds on Earth, including Lex Luthor, are under suddenly Brainaic's control. Batman pleads with Superman to get out of Brainiac's range and fast. Superman would do that but his friends are in trouble. He saves Baka first but soon Baka is also under Brainiac's thrall. Superman takes him to Lois who doesn't believe she is powerful enough to help but knows that Batman and crew will get this figured out. She telepathically contacts Martian Manhunter and they realize that while Brainiac has control of a whole bunch of people he isn't killing them which means he needs them alive. Superman has Krypto watch over Baka and the rest of Metropolis while Lois has John Corben do the same. When John asks what Lois is going to do she replies that she and Superman are going to save the world. Lois and Superman head to the Fortress where they watch Cyborg reel Lana Lang and Steel into the Justice League Satellite. They take stock of who has escaped assimilation when Wonder Woman arrives. She is happy to see Lois and happier to see Superman. Lana is certain that Brainiac is networking everyone's brains for processing power and while they want to go smash the mothership Lois isn't sure what that would do to the seven billion people in the network. All eyes go to Superman who has an idea. While Harrow and the Ghost Soldiers provide a distraction Superman flies as close to the sun as he can get and unleashes a powerful blast of heat vision. This sets into motion Batman and Veritas opening a giant Phantom Zone portal. Unfortunately the Ghost Soldiers are taken over by Brainiac, the Justice League Satellite is blown open, the Phantom Zone portal is closed and the Mothership is about to crash into the Earth. With Lois' encouragement Superman and Martian Manhunter are able to save the Earth but the Fortress collapses on Batman, Lois and the others. Worse Non and Mongul have escaped from the Phantom Zone and their objective is clear...they are going to murder this filthy world. Five years from now Clark Kent plants seeds in a barren stretch of land in Ethiopia. A man named Joseph questions the sanity of such an act as nothing has grown there in some time. Clark is determined and points out that a friend is allowing them to use an irrigation system. As Clark's father used to say even when things look bad you keep putting one foot in front of the other and keep planting seeds. Elsewhere a woman leaves a suicide note and prepares to jump from a window ledge. When she does she discovers she has the ability to fly. Elsewhere a young man named Donny is being beaten up by the minions of a man Donny owes money to. In the middle of the beating Donny develops super strength and after dispatching his would be dispatchers Donny immediately wants to cash in. Elsewhere a small child named Jaimie watches his father slap his mother to the ground. Jaimie stands up for her and discovers he is invulnerable. Later the woman, Donny and Jaimie are all visited by a sand-like creature in the shape of Superman. He explains that the gift he gave them was temporary and that it is up to them to better their lives according to what they were going through. The three people intersect at a hospital and seem to have learned something from their encounters. The sand creature flies to Ethiopia and confronts Superman. At first Clark believes that the creature is there to spur him back to action but it explains that he loaned out his power to many people. Some chose better than others but after each encounter the creature grew stronger. He is finally strong enough to repay Clark's inspiration through one final challenge. The creature flies into the sky and explodes. His residue makes the soil rich and gives it the ability to grow food for generations. He restored the land's potential but Clark wonders if the final challenge was to show Clark that he wasn't living up to his full potential. Today. Three in the morning. Clark Kent begins to write an article titled, "Who Needs Superman Anyway?" Eighteen hours earlier. A bearded Superman returns to Earth after escaping the black hole he sent Brainiac into. He receives a less than pleasant welcome when a Waynetech satellite hits him with a Kryptonite pulse. Superman is caught by Supergirl and the two journey to the damaged Fortress of Solitude where she catches him up on what has been going on since he flew off with Brainiac. Superman reboots and respawns the Fortress, which will take forty days to complete and when Superman tells her he is going to find out if there is still any danger from Brainiac's attack Supergirl asks how he plans to do that. He isn't sure, but after seeing a Smallville pendant he decides to head there. With his powers still recovering from the Kryptonite pulse Clark takes a bus to Smallville and explores the town via bicycle. 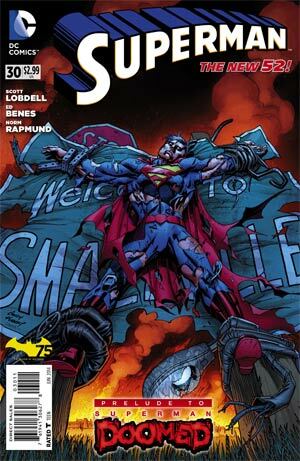 He runs into Lana and the two visit the graves of her parents, who died when Smallville was put to sleep by Brainiac. Lana introduces Clark to her boyfriend, John Henry Irons. Clark is somewhat relieved that Lana has not revealed his identity to Irons, even though he is the hero known as Steel, and they talk over lunch at a local diner. Feeling that Lana and John have things under control Clark leaves and meets with Bruce Wayne. Apparently Bruce covered for Clark's disappearance and feels that Clark should lay low as Superman for a while. 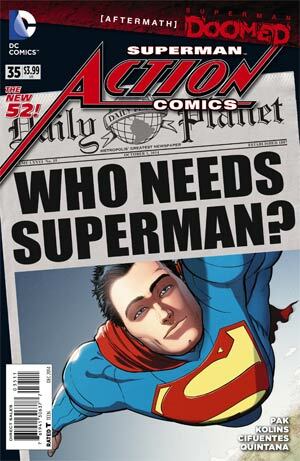 Clark heads back to Metropolis and begins to write the article. The next day Lois knocks on Clark's door and demands how he could write such an article. During the conversation Clark learns that Lois no longer knows that he is Superman. Lois tells Clark that he obviously doesn't know Superman at all and leaves to write an article to refute his. Her article cites Clark calling Superman an alien and details what all of the other aliens, like Martian Manhunter and Supergirl, plus the super-powered people like John Corben and Ghost Soldier, have done in Superman's absence. She ends by writing that she sees Superman everywhere in all of the normal people that are helping each other. Back in Smallville Lana visits her parents grave again and talks aloud about how Clark's article was right. She hears a strange noise that she thinks might be Clark but is horrified to see hands bursting through the graves. She can do nothing but scream at the horrifying sight. Clark and Diana's dinner is interrupted when an astral projection of Lois Lane appears seeking help. Lois' powers aren't going away. Fearing madness she sought Clark out not just as her friend but because as Superman he has to deal with his own powers. Clark swears to Lois he always intended to tell her his secret and the couple share a tender moment. Elsewhere in Suicide Slum, Parasite follows an inexplicable urge to visit the hospital. Back at the hospital Lois is visited by her father, Sam Lane. He tells Lois he'll be taking Senator Hume's role by request of the President. He also reveals the position as Senator Lane will allow him to investigate something called 'The Tower'. As Sam leaves Clark Kent enters, his curiosity piqued by mention of The Tower. Clark asks Lois if she'll reveal his secret identity. Lois replies, coldly that she absolutely will. On the way out Clark has a chat with Lois' boyfriend, who seems jealous of Superman. Parasite arrives at the hospital. Clark meanwhile, logs in back at his office of Clarkcatropolis.com and files a story on Sam Lane. Clark asks Shay Veritas about Lois' progress with healing. Veritas reveals Lois is not healing but transforming in some way into a new form. 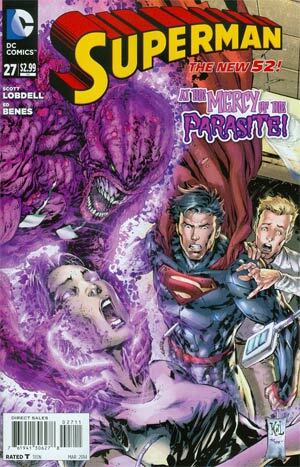 Back at the hospital, the Parasite is on a rampage, which draws Superman to the rescue. Parasite manages to drain some Kryptonian power and uses his newly acquired power to freeze the Man of Steel and slam him deep into the hospital basements. Superman unfreezes himself with heat vision and then... nothing. No attack for more energy from Parasite, no fighting, nothing. It dawns on him that he isn't the only superpowered being in the hospital and flies as fast as he can to Lois only to find Parasite draining the life from her. "1,000 Degrees in the Shade"
Starfire attacks Superman. Superman uses his freeze breath to hold the Princess while he checks on the prisoner he had wrapped in his cape. The man has transformed into a disfigured 'deadling' creature. Starfire bursts free from her icy prison and incinerates the zombie creature. The Princess reveals she knew the prisoner was a human husk hosting a Daemonite and had to kill it. Superman stands fast with his no kill policy. Starfire tells him this was the first time a human had voluntarily died to host Daemonites and Superman lets slip that there are many more Daemonite hybrids and a horrified Starfire races off to find them. Meanwhile Morgan Edge follows Cat Grant home in his limo and asks again for Cat to reconsider selling up ClarkCatropolis.com. An upbeat Cat tells her former boss that she and Clark will not sell their popular blog site and Edge delivers a chilling threat before driving away. Starfire arrives at the holding cells and inspects the weapons, discovering they are really daemonite DNA 'syringes'. The daemonites have escaped their cells and are attempting to kill their captors and escape. Superman uses his freeze breath to stop all the prisoners and takes them to S.T.A.R labs. Superman examines the 'inoculation devices' and realizes they're also a tracking device emitting a subatomic signal he can reverse track. The duo find a small boy who asks for Superman's help. Koriand'r pleads with him not to trust the boy because he is using Superman's trust against him. Superman refuses to listen and is again proved wrong as the boy transforms. The Daemonite backs up the Princess and even mocks Superman for refusing to join their master when he had offered [back in "Superman Annual #1"]. The heroes prepare for a fight but the Daemonite kills itself to avoid the fight. Elsewhere in Metropolis, Jonathon Carroll arrives home to find Lois talking to herself. Upon confronting her he finds her alone and voices his concerns over recent events. Lois uses her telepathy to make him forget the events of the Parasite attack and calm down. In space, Starfire's sister Blackfire is informed of the rogue Daemonites on Earth and their encounter with Superman and her sister. She brushes off her crew's information and in her private quarters seeks audience with Helspont via video transmission. She blames the deaths of the rogue Daemonites on Superman, omitting the existence of her sister. Helspont is annoyed with the involvement of Superman in Daemonite business but he also wonders what scared his servants into trying this stunt in the first place. "All Good Things Must End"
In the Bahamas a loving couple on their honeymoon are frolicking in the sea when one is stung by a sharp but beautiful ivory type stone. They smile and decide to use the stone to forge new wedding rings but water surrounding them begins to boil ferociously and suddenly they are gone. Elsewhere in Smallville the government and STAR Labs have taken up residence to find clues as to why the entire town has fallen into a simultaneous coma. Senator Sam Lane is no stranger to Smallville and its history but when questioned even he draws a blank as to what has happened. Superman arrives and at Senator Lane's suggestion scans the town for clues. Superman finds nothing, the townsfolk are perfectly healthy, just all comatose. Lane mentions odd crop circles in the surrounding fields and Superman races to investigate. He finds the word 'DOOM' spelt out in the fields in Kryptonian text and finds someone alive hiding in a grain silo. 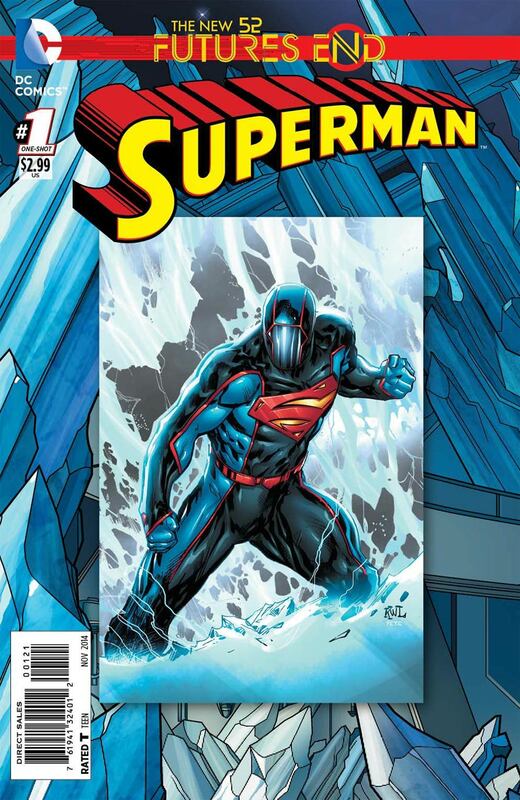 Speeding inside he finds his powers failing and meets a foe Kon-El encountered (in 'Return to Krypton') The Eradicator. Eradicators usually appear when a planet is dying to aid its end but for some reason he has been hiding on Earth. He warns that if Earth was to die a natural death its own Eradicator would have manifested instead he reveals that he had been waiting to warn Superman that Earth will be murdered. Superman asks if it is Doomsday that will kill Earth but the Eradicator angrily punches Superman into orbit and growls that Superman will be the one to kill the Earth. With the Eradicator vanishing Superman contacts Cyborg and asks him to check into things from JL Headquarters while he flies back to Earth. Back in Metropolis, Lois is back at PGN after her recent hospital stay. Perry scowls that Lois is not on the beat and she psionically knocks him out sending her mind across space, there she meets up with her new husband, Brainiac! Clark calls in sick to Cat to cover his absence from blogging on clarkcatropolis.com and tries using the Fortress equipment to find if Doomsday is causing problems. While preoccupied he doesn't notice that the bottle city of Kandor's comatose citizens wake up and begin pounding on the glass walls. Cyborg reports back to Superman that while scanning for Doomsday he has found that the Bahamas has been completely destroyed. Superman is restrained in Lex Luthor's former prison. Having been infected by Doomsday after tearing his physical form in half Superman is literally being taken over by Doomsday particles. Batman, Cyborg, Doctors Ray Palmer and Veritas via hologram are working side by side with Lex Luthor to find a cure. Superman emits Doomsday particles in surges growing more powerful with each emission. The Doomsday effect cuts off Veritas' hologram leaving her alone in The Block. Determined Shay begins analysis of the Doomsday particles she had captured for her in Smallville. In the meantime Lois arrives via helicopter and attempts to comfort Wonder Woman who is waiting outside the base. Superman has asked for Lois to give a final interview much to Lex's shock. Batman honors his friend's wish and allows Lois and Clark time alone despite Lex warning that the next Doomsday spore emission will infect them all. Superman asks Lois to write an article warning them that he can never be trusted again, now that he is infected with the Doomsday spores he will eventually be taken over by them and become the dangerous monster. Lois on the physical plane is herself but psionically her Bride of Brainiac self awakens and strangles Superman. She laughs off what a pathetic creature he has become and that he still cares for Earth even though it won't be around much longer. Lois shows him a projection of the Teen Titans being attacked by Detritus which, though dead, is somehow still moving around attacking them. Unable to ignore the peril the teens face Superman screams out, breaks his bonds and escapes despite Batman offering assistance and warning him to stay put. Wonder Woman watches as Superman soars away and prays that a solution can be found by Steel and what he brought back from the Phantom Zone. Diana contacts Cyborg in the Justice League Space Bunker hoping to track Superman or the Teen Titans down, and in the meantime Batman attempts to question Lois. He knows something during their private conversation set him off but Lois uses her psionics to make him forget and let her leave the base. Superman races to the location Lois projected at him and makes short work of Detritus. The Titans step back in fear seeing a half Superman/half Doomsday standing before them. As the Titans watch helplessly Superman, realizing something is terribly wrong soars skyward. "The Men of Tomorrow" - Chapter One: "Ulysses"
"The Men of Tomorrow" - Chapter Two: "The New Superman"
"The Men of Tomorrow" - Chapter Three: "Ulysses"
The mysterious man with the view screens continues watching facets of Clark's past and present. He walks over to some metal gates and speaks to something or someone locked behind them but they stay deathly silent. At that moment Neil/Ulysses is reunited with his parents and they endure a rush of emotions explaining their actions from both sides. Neil explains Klerik led him here and is now defeated, leaving him to enjoy a new life with his family; reunited at last. Clark watches their reunion and it is obvious that he draws comparisons to his own life and origins and more so when the Quinn's tell him he is a part of their family now too. Later when Clark is home in bed, Neil appears in his apartment and asks Clark why he sleeps and if he dreams as Clark or Superman. The two bond over a reoccurring dream he has about his birth parents until Neil presents a robotic part of a soldier that had attacked Metropolis. Neil reveals his energy absorption powers can follow the soldier's trail back to the source. They suit up and arrive at The Scrap Yard, a place where any debris from attacks on the city is held. Whoever is responsible has built a hideaway under the Yard. As Superman tries to scan underneath his heat vision bursts into action uncontrollably. Neil reveals it is his presence - he can absorb Superman's energies or 'magnetize' the stored power. As the duo get deeper into the facility they find a manufacturing plant and Ulysses is bitten on the head by a robotic mind-tick. The tick forces him to attack Superman. The two fight until Superman is able to destroy the tick. At this point The Machinist makes his presence known to the heroes and reveals he uses scraps from the Yard to create weapons and robotics to sell and tries to use his mind-ticks to take over Superman. Ulysses leaps to the rescue and uses Superman's absorbed heat vision to kill the Machinist. Superman is shocked and Ulysses is visibly shaken to have killed. The Machinist reveals he is still alive and that the man under the mask was an innocent civilian and he drove the heroes to attack and kill. Five years after the story of Ulysses and Superman... Two teens from Starling City arrive in Metropolis keen to party and spend their gambling winnings. A shadowy man grabs them and throws them into the path of a train. In the Centennial Park District the masked Superman rescues two children from a burning building, the last of many he has rescued from the inferno. A fire fighter steps forward and demands that he reveal why he is impersonating Superman. The Masked Superman snaps and yells at them for their ungratefulness and soars away. Later Lois is following up on her expose and tracks down the Masked Superman to his apartment and offers him the chance to tell his side of the story as to his masquerade. Billy is angry that Lois made him look like a liar and a fool in her story, but Lois coldly explains her job is to report what she saw and she saw Billy Batson become the Masked Superman. Lois asks a question: "Why do you feel like you owe the world a Superman?" Billy explains the flaw in her question, he owes the world nothing, but he owes Superman himself. Billy recalls a fight years ago in a war with Apokolips. The war had led to Black Adam and Shazam fighting side by side against the hordes but when Adam saw that Shazam might fail and with him the power of Shazam would be lost he double crossed Billy and attempted to steal his power and kill him. Superman however arrives in the nick of time and saves Billy's life. Superman activates a Phantom Zone projector and ends Black Adam's threat immediately. Superman advises Shazam to rest but Billy refuses pointing out that France is about to fall. Superman, downhearted tells Shazam he cannot help as he has another mission, one that deeply sickens him. Billy offers to help but Superman tells him that "He" has ordered Superman to complete the mission alone. Superman soaring away is the last Billy or anyone ever saw of Superman ever again. Lois is troubled by this and the only solace is that whatever Superman's secret mission was it won them the war, but nobody knows what Superman had to do or where he vanished to, and if they did they are being silent. The Justice League were worried that because the world looked to Superman as a sign of power and hope, if it was lost, hope would die out and as Shazam was the closest in powerset to Superman they asked for him to step in. Though Lois notes his noble attempt, she points out that he is devoting his own life and existence to the memory of Superman instead of living a life and maintaining a real identity. An emergency cuts the interview short and Billy has race to the train wreck. The shadowy man that killed the teenagers reveals himself to be Ibac an old enemy of Shazam's who had believed he was dead. Ibac, newly powered by magic is now super strong and fights Billy to a standstill before throwing train carriages at the nearby public. The leaking gasoline gives Ibac the idea to light it which results in a major explosion. Billy grabs Ibac and soars skyward with his foe. Ibac laughs that he is invulnerable, he can't die. Billy points out that though the fall from the far reaches of Earth's atmosphere won't kill him, it will still hurt and knock him out. Lois arrives having watched the battle, she tells Billy that though he isn't really Superman he is just as effective. Billy reveals that for years he fought Superman's villains but after the article, Ibac came hunting for HIM not Superman and though Lois has given her blessing for him to continue masquerading as Superman in his honor, Billy reveals the recent events have led him to a conclusion: The world needs Shazam. Billy now in his old identity flies away and tells Lois he will make sure nobody forgets Superman but that the world needs to remember it has other heroes besides Superman. "The Men of Tomorrow" - Chapter Four: "The Quick Fix"
Hex's journey through the modern age continues! Guess whose attention Hex attracts as he makes his way to Metropolis! Atop of a building, Superman looks out over Metropolis, a queer foreboding running through his thoughts. He takes flight only to be accosted by what appears to be the specters of Doctor Light, and numerous unidentified spirits, all pointing at Superman in accusation that he did not save them. Elsewhere, the Phantom Stranger speaks with Zauriel, one of Heavens' angels, regarding events that have recently transpired. Their conversing is interrupted, when Stranger is alerted to a "mystical anomaly... a hairline crack in creation". The Stranger investigates the breach, and finds Superman being beset by the aforementioned spirits. They spirits are banished, and the Stranger tends to Superman. 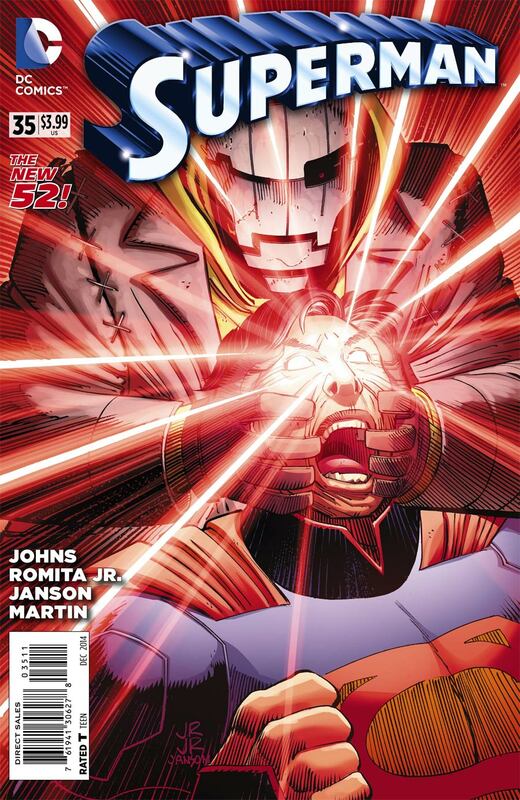 Superman confesses that he believes Doctor Light and the others were right; he is responsible for their deaths. Superman then moves to find Light and the rest, and make it right. In a warehouse on the edge of the city, Superman finds the spirits and agrees to submit to their demands for expiation: he must let them in completely. The Phantom Stranger intercedes, and nearly has to give Superman a "mystical lobotomy," but stops and allows Superman to proceed with what the Stranger believes is folly. However, Superman survives his "possession" and his will, in turn, seals the crack in creation. What appeared to be Doctor Light transforms as it destroys the warehouse, revealing himself as the Sin Eater. Superman asks why the Phantom Stranger allowed him to submit, and the Stranger replies that he had faith... in Superman. A squadron of fighter jets engage Doomsday on the Honeymoon Island in the Bahamas with disastrous results. Superman arrives but not in time to save all of the pilots. The Man of Steel tries to convince the military to retreat but they refuse. He examines the island and finds thousands dead. Later he meets with Dr. Shay Veritas in the Fortress of Solitude. She reveals that the Doomsday Superman faced before was in a larval state and the creature he faces now is much more powerful. Superman asks if Doomsday is alive which leads to a conversation about whether or not Superman should kill the creature. Veritas insists that he can't worry about anything else until Doomsday is dead. Meanwhile Lana Lang sneaks into a quarantined Smallville thanks to Lois Lane. In Metropolis Clark Kent seeks advice from Perry White. Back in Smallville Lana tries to contact Clark but he tells her that while he is sorry he can't be there right now. Around the world in Botswana a crew shooting a nature documentary run afoul of Doomsday. In "nearby" Zambia John Henry Irons is visiting his niece when Doomsday reaches them. 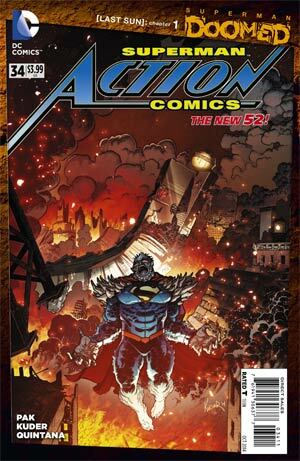 Irons puts on his Steel armor and engages Doomsday in battle but things go poorly for him. Wonder Woman arrives and takes Doomsday on but the monster manages to spray her with poison. 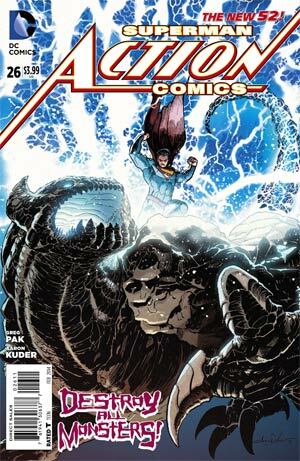 Superman is next on the scene but just as he and Wonder Woman prepare to really bring the fight to Doomsday the monster disappears. The two heroes join the rest of the Justice League in the emergency bunker under Washington DC. There they go over the damage the creature has caused before Lex Luthor arrives and explains that Doomsday is drawing in energy and growing thanks to that sustenance. 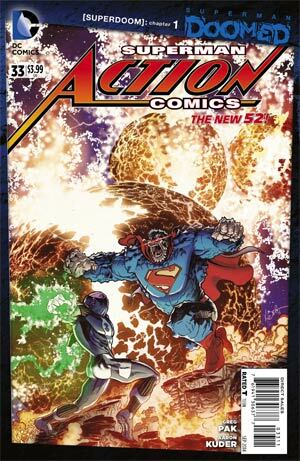 Lex suggests that since Superman is the most obvious target he should leave the planet and Doomsday will follow. The League doesn't take kindly to this news but Superman agrees with Lex. He says his goodbyes to Batman and Wonder Woman before leaving the bunker. 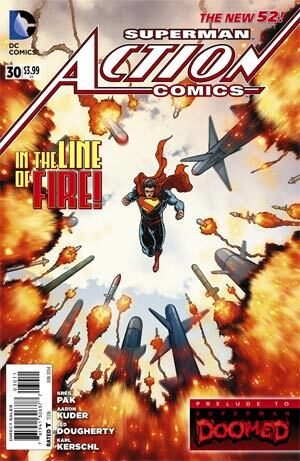 Superman finds Doomsday in India and the two begin to fight. The battle is awe inspiring as Superman takes the fight off planet and to the planet Venus. Using every bit of strength and energy he has Superman blasts Doomsday with his heat vision and believes he has put the monster down. 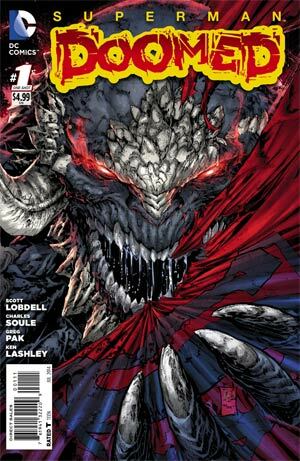 Superman heads back to Smallville but Doomsday follows him. The battle begins anew but it is short lived as Superman tears Doomsday in half. Injured and exhausted Superman slumps to his knees and collapses. "Last Sun" - Chapter 4: "Evolutions"
As Batman, Martian Manhunter, Lois Lane and Lana Lang watch as the people of Smallville begin to die Superman, under the influence of the Doomsday Virus, makes his way towards Brainiac's mothership. 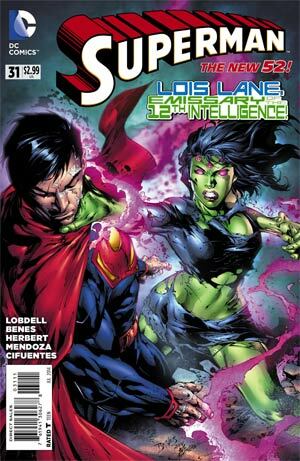 With Lois' help Lana is able to make telepathic contact with Superman and she tells him to kill Brainiac. The main battle with Brainiac takes place in Superman's mindscape. The alien has a simple plan; get enough minds together so that he has the power to remake reality. He tempts Superman a number of times but the Man of Steel sees through them each time all the while his monstrous body tears through the ship. 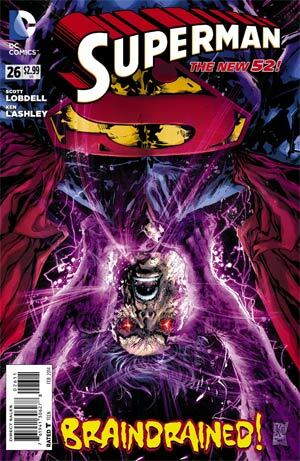 Lois arrives in Clark's mindscape and helps Superman fight Brainiac and even reveals the villain's origin. 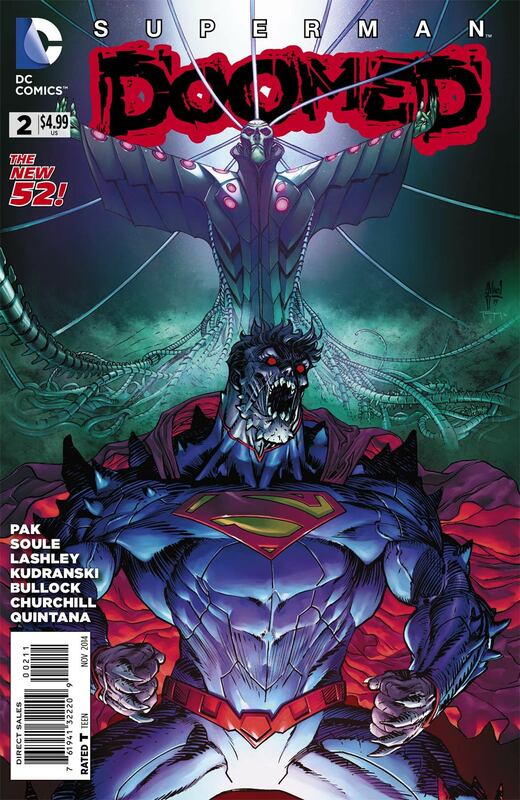 Finally the Doomsday Virus riddled Superman uses the last of his strength to push Brainiac through a dimensional rift. In short order people start waking up around the globe and Lois's powers disappear. Brainiac falls through the dimensional rift and manages to reset himself. As his systems scan his surroundings Brainiac sees shards of other realities. A different Superman. An azure colored hero descending from a giant flying beetle. A stretchable hero with a man dressed as Uncle Sam. A vampire Batman. He asks the only question he can...what is this? 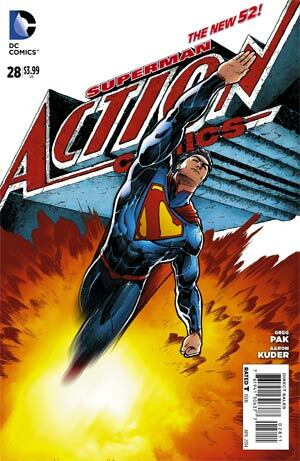 Here is a listing of the regular Superman titles (Action Comics and Superman) since the 2011 Flashpoint saga that relaunched the DC Universe of comic books. For accuracy almost every entry is based upon actually looking in the issue, and not memory or another source.